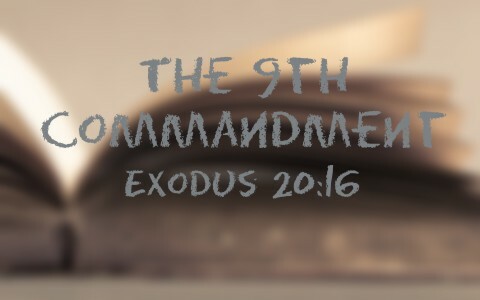 What is the 9th Commandment? Is it still important today? When Moses came down off the mountain with the Ten Commandments, the Israelites had already broken most of them. He was angry with them and threw them down to the ground, smashing them in the process, just like they had broken them, but in truth, God’s Ten Commandments cannot be destroyed by breaking them but those who do can be destroyed by God. That logic would be like if we break the speed limit, it is, no longer in effect. Try telling that to the officer behind you. In speaking of Jesus’ coming judgment of the unsaved, He said “The Son of Man will send his angels, and they will gather out of his kingdom all causes of sin and all law-breakers, and throw them into the fiery furnace. In that place there will be weeping and gnashing of teeth” (Matt 13:41-42). Most certainly, these are not the Mosaic Laws that Jesus was speaking about but God’s, holy, moral, righteous Laws as contained in the Ten Commandments but what about man’s laws? The Apostle Paul wrote, “whoever resists the authorities resists what God has appointed, and those who resist will incur judgment” (Rom 13:2) because “he is God’s servant for your good. But if you do wrong, be afraid, for he does not bear the sword in vain. For he is the servant of God, an avenger who carries out God’s wrath on the wrongdoer” (Rom 13:4) so “one must be in subjection, not only to avoid God’s wrath but also for the sake of conscience” (Rom 13:5). God expects us to keep man’s laws, as long as they don’t conflict with God’s laws or commands (Acts 5:29), but He also expects us to keep the Ten Commandments. Even though it’s humanly impossible to keep these Commandments, that doesn’t mean we don’t try to live by them. If we don’t, we have no excuse. The 9th Commandment says “You shall not bear false witness against your neighbor” (Ex 20:16) but you might ask, “Is this just for my neighbor?” No. Jesus was asked “Who is my neighbor” by a lawyer (Luke 10:29) so Jesus told a story about a man who fell among thieves and was beaten and robbed (Luke 10:30), but when a priest came by, he went out of his way to avoid the man (Luke 10:31) and even a Levite when seeing the man, “passed by on the other side” (Luke 10:32) “But a Samaritan, as he journeyed, came to where he was, and when he saw him, he had compassion. He went to him and bound up his wounds, pouring on oil and wine. Then he set him on his own animal and brought him to an inn and took care of him. And the next day he took out two denarii and gave them to the innkeeper, saying, ‘Take care of him, and whatever more you spend, I will repay you when I come back’” (Mark 10:33-35). After this, Jesus asked “Which of these three, do you think, proved to be a neighbor to the man who fell among the robbers?” He said, “The one who showed him mercy” (Mark 10:36-37). The point Jesus was making was that anyone we see who is in need is our neighbor and all people should be considered our neighbor, no matter who they are, as evidenced by the Samaritan being helped. If you remember, the Samaritans were despised by the Jews, but Jesus tried to show them (and us) that all men and women we meet are our neighbors. I heard one pastor say that lying is cosmic treason against the Creator God. We can lie to ourselves and to our neighbors, even to our own family, but not to God because “no creature is hidden from his sight, but all are naked and exposed to the eyes of him to whom we must give account” (Heb 4:13). Scriptures say that all men are liars (Psalm 116:11), but as Moses wrote, “God is not man, that he should lie, or a son of man, that he should change his mind. Has he said, and will he not do it? Or has he spoken, and will he not fulfill it” (Num 23:19) since it is “by two unchangeable things, in which it is impossible for God to lie, we who have fled for refuge might have strong encouragement to hold fast to the hope set before us” (Heb 6:18). Aren’t we glad that God cannot lie? If so, what would we do with John 3:16 and other such truths? But of course that’s impossible because it’s against God’s holy nature to lie (Heb 6:18), but it’s our very nature to do so, and in this you can be sure, I am not lying about that (Num 23:19). Here is some more reading for you: What Are the Ten Commandments?